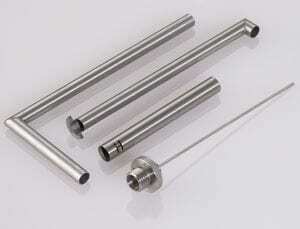 In determining what grade of stainless steel tubing to select many factors are taken into account. The main requirement for stainless steels is that they should be corrosion resistant for a specified application or environment. Strength and fabrication characteristics are also taken into consideration. There are more than 60 grades of stainless steel. However, the entire group can be divided into four metallurgic classes. In determining what grade to select, additional mechanical or physical properties may also need to be considered to achieve the overall service performance requirements. Chromium (17-25%), Nickel (8-25%); non-magnetic, not heat treatable. It can develop high strength by cold working. Additions of molybdenum (up to 7%) can increase the corrosion resistance. 300 series resists corrosion and uphold their strength at high temperatures and are easy to maintain. Type 316 contains slightly more nickel than Type 304, and 2-3% molybdenum giving it better corrosion resistance. Typical uses: surgical applications, food, and beverage equipment, wastewater equipment, chemical equipment, architectural applications. Straight chromium (12-18%); magnetic and can be hardened by heat treatment. Type 410 resists corrosion in mild atmospheres, steam, and mild chemical environments. Typical uses: fasteners, machinery parts, pump shafts. Straight Chromium (12-18%); low carbon, magnetic, but not heat treatable. Typical uses: highly polished trim applications, food processing. Chromium (12-28%), Nickel (4-7%); martensitic or austenitic. The typical grade 17-4 name comes from the additions 17% Chromium and 4% Nickel, it is also known as grade 630. They have high strength, relatively good ductility, and good corrosion resistance at moderate temperatures. Typical uses: valves, gears, pump parts, bolts, saws, shafting. Austenitic stainless steel is the largest group, making up two-thirds of the stainless steel productions. Eagle Stainless stocks 300 series stainless steel in both seamless and welded tubing for a variety of applications. If you need help on ordering your tubing see these top ten tips to help with the ordering process.